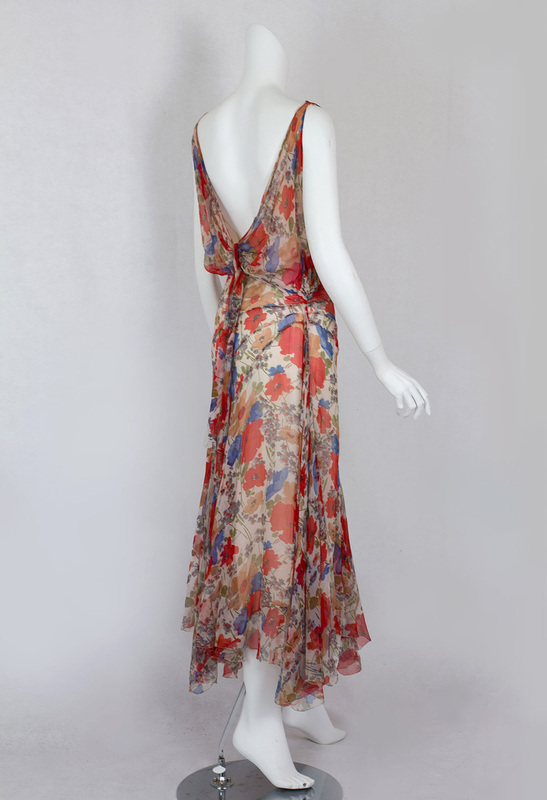 The floral chiffons of the late 1920s-1930s were like a delicate summer breeze after the hard edged geometry of Art Deco. 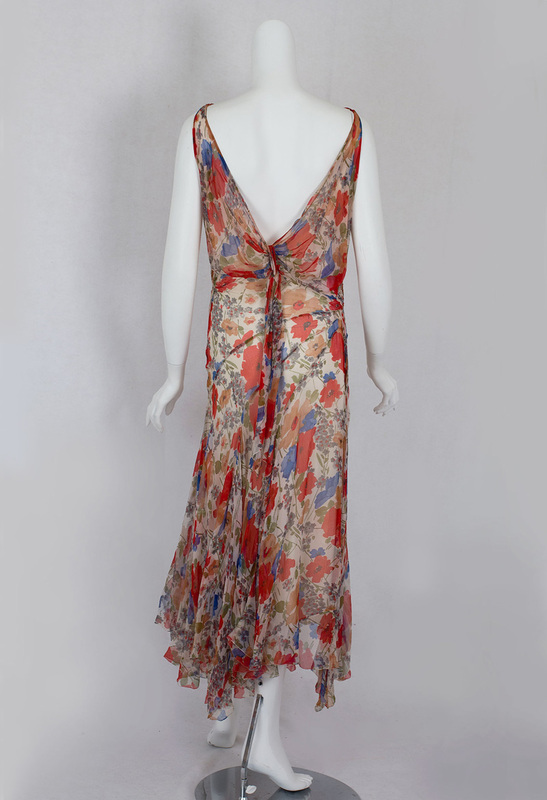 This charming dress—from the endpoint of the flapper period—has the slinky, form fitting silhouette and hip-seam detail that anticipate the longer styles of the 1930s. Like birds circling before the storm, fashion designers sensed the end of an era. This silhouette became synonymous with Hollywood sophistication during the Depression when America craved fantasy and beauty. Major changes in silhouette—rippling through all levels of fashion—are caused by the very same economic factors that transform women's roles in society. 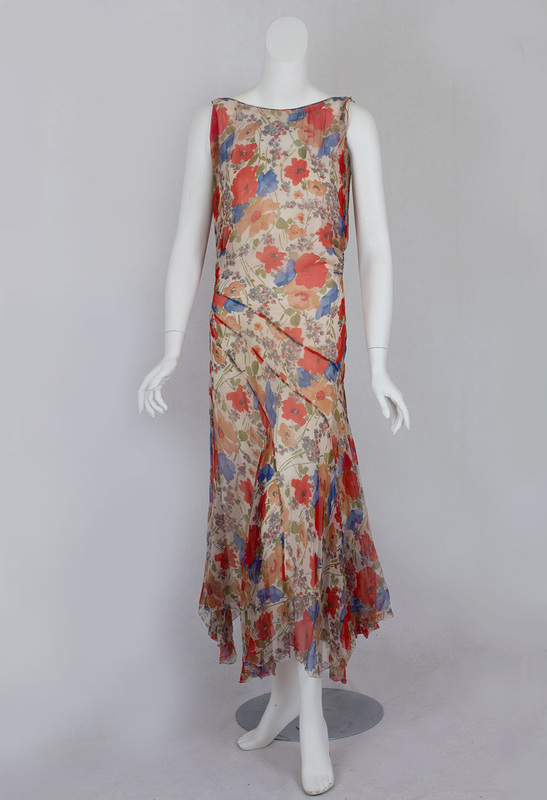 In our lovely dress, the hybrid style combines a sophisticated 1930s silhouette with an endearing floral print, whose sunny hues—for a 1930s viewer—symbolized the unbounded optimism of the carefree 1920s. As the 1926 hit song put it: "Blue skies smiling at me; nothing but blue skies do I see...Never saw the sun shining so bright; never saw things going so right." I love a dress with back detail. The bias-cut bodice, dipping almost to the waist in back, is tied with a flirty sash. The skirt is form fitting to the hipline where it takes on an exaggerated sweep with bias-cut panels. 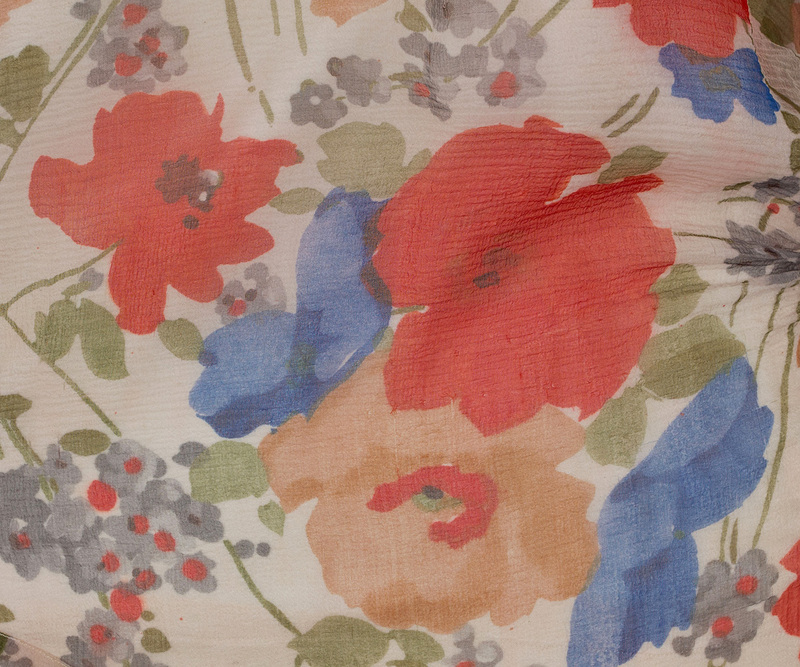 With their competing and complementary hues, the brilliant floral motifs are of the last degree of charm: denim blue, olive green, flame red, and apricot. Here we see blooming flowers tenderly stretch out their petals, yearning for the sun's caressing rays. 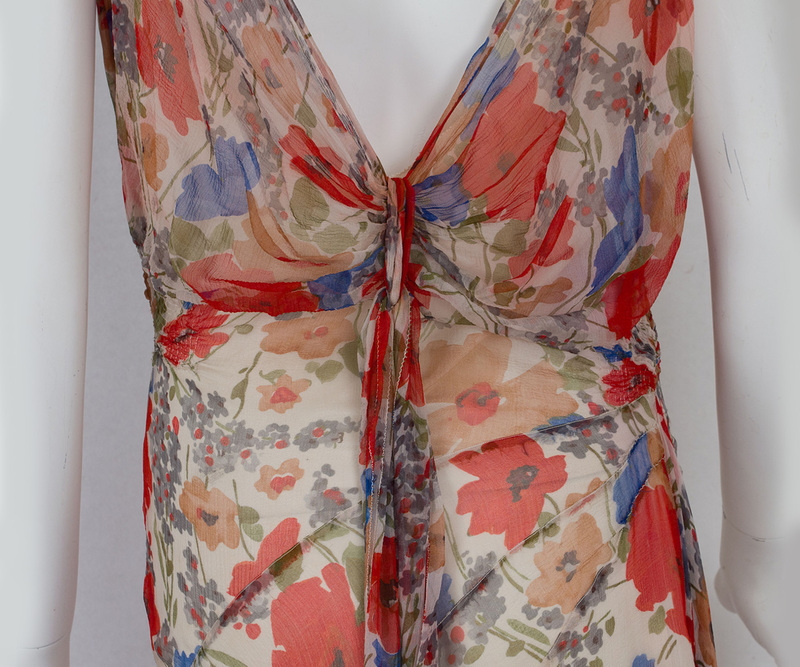 This beauty comes with the original ivory silk crepe-de-chine slip, which closes on the side with hooks. 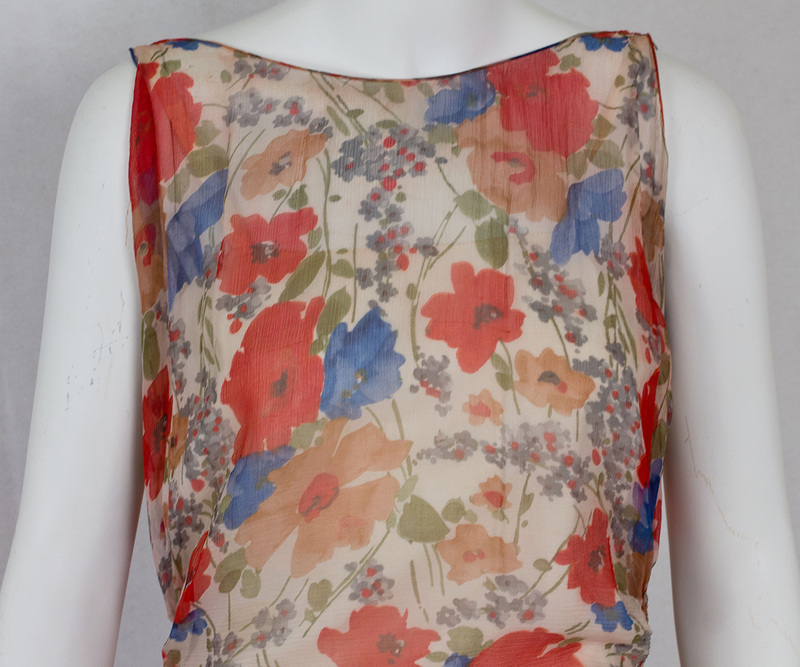 The slip is held in place at the shoulders with narrow fabric bands. The skirt of the slip is slit to the waist on one side. The condition is excellent and wearable. The slip has one small, barely visible mend near the hem border. It measures: 38" bust, 30" waist, 38" hip, and about 55" from shoulder to hem.